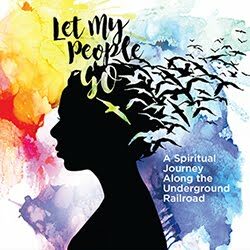 Pgh Momtourage: Help us raise free funds for our t-shirts! The Pgh Momtourage was originally formed as a playdate venue to connect moms, kids, & families together. We believe strongly in the power of community and want to connect with others around our city. And we have the awesome opportunity to explore a ton of kid-friendly venues in the process! 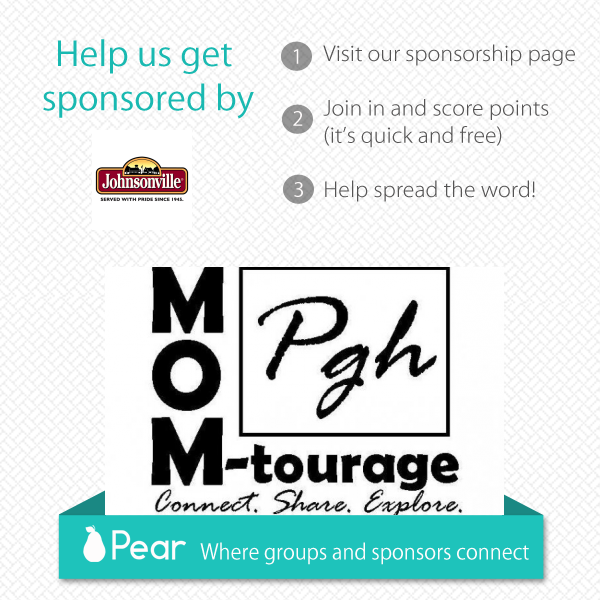 I was recently contacted about the concept of Pear which creates a sponsorship opportunity for the Momtourage. And what a fantastic program! I created a Pear to raise money for new Pgh Momtourage t-shirts. T-shirts allow our group to easily recognize each other when we are out at playdates in more public & busy venues. It's SO easy to help us raise money! All you have to do is go here to our Pear sponsorship page and it will give you a choice of actions to complete which gives us free money! 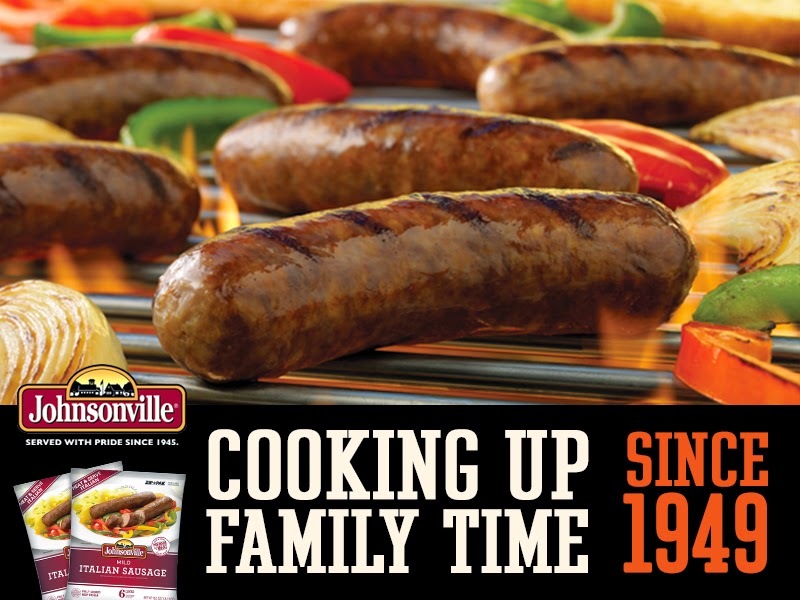 Some are as easy as answering the question, "What do you like to eat alongside your Johnsonville sausage?" No one has to contribute money of any kind! Do you have a group that you would like to raise money for? Family reunion, school group, baseball team, church event, missions trip, scout group....you can create your own Pear for your event or group! Share your Pear in the comments to get support from other readers. Moms, aunts and girlfriends whose friends are like family. If you are in the Philadelphia, Pittsburgh or Baltimore areas, your social network can help raise $1,000 or more toward custom apparel! How? 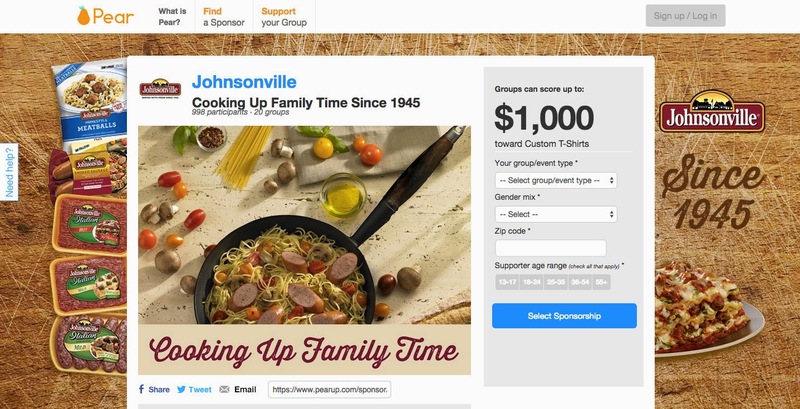 By getting sponsored by Johnsonville on Pear! Not a part of a group but your child is? You still qualify! To get started, create a sponsorship page on Pear & invite friends to join in. The more people who join, the more money your group can earn toward apparel and merchandise! So please join us in this easy raising of funds - we only have 8 days left! Go here to support our group. And THANK YOU for your help! This post sponsored & compensated by Global Influence. Thanks so much for sharing Pear with your readers! We really appreciate it!